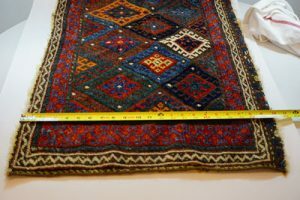 Most experts will suggest about 50 cm of floor space on every side of your rug. If you have a particularly large living area, your rug may run under the furniture in the room, like your tables and couches. If your living room isn’t quite as large and you’ve purchased a statement rug, we recommend placing it in front of the couch. If possible, make sure that your couch and your rug are the same length. A fun way to tie together the design of the room is to define different areas using rugs in the same color family or pattern. This is a room where the rugs can be as plush and luxurious as you’d like. Dining spaces are a bit easier than living room spaces. The only good rule of thumb here is that the rug should be large enough so that when chairs are pulled back from the main table, the rug is still showing. We recommend rugs in this space that are easy to clean, so that you can focus less on what the room looks like and more on the delicious meals shared at the table. You can revert back to plush rugs for bedrooms, they’re the most comfortable on bare feet first thing in the morning. You have several options for the design of the bedroom. We recommend either one large rug that’s large enough to jut out about 50 cm every side of the bed, or a couple of smaller rugs on either side of the bed. Pick a color that pairs well with the bedding, or brings out the stain of the furniture around the room. These rules aren’t steadfast. Part of the fun of this industry is the creativity that comes with it. When you work with Knox Carpets you know that your vision will be brought to life and we’ll be with you every step of the way to ensure our customers are happy and that their houses are the homes that they’ve always dreamed of.